Last night I had over my girlfriends from work. What a beautiful night filled with laughs, cocktails and great food. Well needed for sure! While thinking of the appetizer menu I wanted to prepare a few things in consideration: I wanted to make it ahead (so when my girlfriends got here I was able to enjoy more time with them. I’d rather have something baked instead of fried (so the cleaning was easier and my house didn’t smell like a Chinese take out place) and last but maybe the most important I wanted to make something different than the usual chips and dips. Something flavorful! So I came up with these Asian rolls. They were very tasty. The best part was I was able to get a nice crisp just baking them. Brushing a generous amount of olive oil on them was the trick. The flavors came together very nicely. I recommend these rolls for any party. Easy to make ahead and just pop them in the oven right before your ready to serve. Not so many ingredients and very affordable as well. Let’s start with the egg roll wrappers that I used. I bought the Nasoya brand that I found at Whole Foods. You can also find them at any Asian supermarket or by the organic juices and dressing at the bigger supermarkets. For the filling I used ground chicken. The key to get a lot of flavor is to use fresh ingredients like ginger, garlic and fresh herbs like scallions and cilantro. That is the main booster of the recipe. I sautéed the ground chicken in olive oil. Once they started to brown I added the shredded fresh ginger and finely chopped garlic. I added salt and pepper to taste and the fresh chopped cilantro and scallions. Then I added hoisin sauce and mixed well. I took the mixture out of the heat and added the cole slaw mix. I stir until well mixed. Spread the wonton wrappers on my working table and added 2 full tablespoons of the filling in the middle. Folded one corner to the middle of the wrapper covering the filling. Then folded the side corners to the middle and the last corner closing the roll. I placed them on a non stick sheet pan with the last corner facing down. I brushed a generous amount of olive oil on top and baked them for half an hour or until golden brown. The key is also to turn them half way to crisp evenly. The girls and I really enjoy this appetizer and few others too that I will be sharing soon. Stay tuned! Oreo Strawberry cups: surprise your loved ones this Valentine’s! 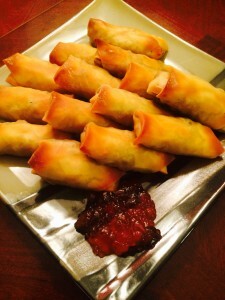 These look great… the hubby and I love chinese food so I’ll be sure to pass this one along!!! !